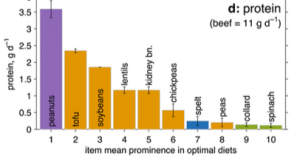 Recognizing that beef consumption needs to decrease to meet environmental sustainability goals, a group of scientists (Eshel and co-authors, 2016) recently set out to figure out the best combinations of plant foods to replace red meat. Starting with a list of 65 plant foods, they randomly sampled from this group repeatedly (to mimic variability in food availability and choices) until they had 500 different sets of plant foods. Next, for each set of foods, they used a mathematical technique (called linear programming) to find the best combination of those foods for replacing beef, taking into account both nutrition and the environment. 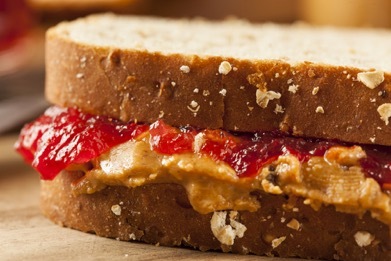 Nutritionally, the optimal combination for each set had to provide at least 11 grams of protein and at most 16 grams of fat without being too bulky (so the amount of food could be reasonably consumed). To consider environmental sustainability from different perspectives, they ran three different optimizations for each of the 500 sets, first minimizing carbon footprint, then land use, and finally nitrogen use. Giving equal weighting to the three environmental optimizations, they then averaged the contribution of each food in the 1500 optimizations. Figure 1 (from Eshel et al. 2016) shows the major foods in the 1500 scenarios for substituting for beef in a nutritionally and environmentally beneficial way. Peanuts were the number one food for obtaining both energy and protein while minimizing environmental footprint (the graph shown here depicts the foods in terms of their contribution to protein). Soybeans and other legumes were also important. There were other nutritional benefits from the plant foods—many vitamins were far more plentiful in the plant combinations, and there was no cholesterol. The authors note that vitamin B12 should be supplied by supplementation in the plant-based diets. The resources that could be saved by the substitutions studied here are very dramatic. Figure 2 (from Eshel et al. 2016) shows per person resource use in red for the beef and in green for the plant-based alternative. Eshel, G., Shepon, A., Noor, E., and Milo, R. (2016) Environmentally Optimal, Nutritionally Aware Beef Replacement Plant-Based Diets. Environmental Science and Technology, 50:8164-9168. Carbon footprint values are from Heller, M.C. and G.A. Keoleian, G.A. (2014) Greenhouse gas emission estimates of U.S. dietary choices and food loss. Journal of Industrial Ecology.